Rocio You may remember our friend Rocio. We recently celebrated her new birth at her baptism in the Chattahoochee River! Her infectious joy overflowed to all of us who were there, including the three Jewish families who paddled by in canoes at the exact moment! Rocio was supposed to return to her family in Mexico 10 days ago. We know she did not make her flight, and we are not sure where she is, since we have not heard from her. Pray for her safety and encouragement, and for us to hear from her soon. A Story of Hope My longtime friend Doug Keefe called me one evening last week and enthusiastically said, “I have great news for you!” He went on to tell me how he had gathered some employees at a dealership, where he details cars, to share the gospel with them. Doug has a passion to help the lost find new life in Jesus. He bought these men lunch and shared the good news with them. A few days later one of the men, Antonio, asked Doug if he would marry him. Antonio had been in prison, where he came to know Christ. He told Doug that he was living with his girlfriend, Doreen, and they had a child out of wedlock. After praying about it, Doug agreed to do the ceremony, but he wanted to find out if Doreen was a believer. 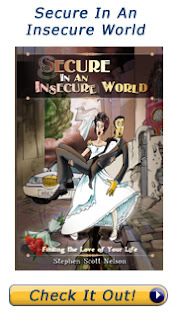 He decided to give Antonio a copy of my book, Secure In An Insecure World, for her to read. Then, last Thursday, Doug met with both of them, went through the gospel again, and asked Doreen if she had ever given her life to Christ. She told him that when she finished reading my book she asked Christ to save her, right there on the couch. That was indeed great news! Please pray for Doug as he helps these new believers grow spiritually, and to share the good news with their friends. 1. Rocio. Please pray for Rocio’s safety, encouragement, and her family’s salvation. 2. Secure In An Insecure World. Both the Spanish and English versions will be available on Amazon, hopefully about the time you receive this letter. Pray for God to use this book to bring many to Christ, and to help Christians have secure lives and marriages. Consider ordering some copies to give as Christmas presents to students. It is also available on-line as an e-book. 3. House Church. Pray for a young man named Ben to grow and find fellowship. He recently asked Jesus to be his Lord and Savior, and will be on a ship for 4 months! Pray too for newlyweds Robert and Tershel to start off well, learning to live for Christ and others together. 4. Apartment Outreach. Pray for Grace and Ward and the three families with whom they are having a discovery Bible stud. Pray for many to come to Christ. 5. Reaching Russians. Pray for opportunities to reach Russian speaking people here in Atlanta. 6. Clemson. Finally, pray for the students at Clemson Timmy Powers, Brian Bridgeman and I shared Christ with this week to be saved. We had a fantastic time working with Christian students who are involved with Brian at Clemson. They worked with us.